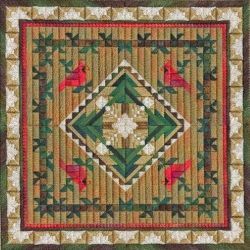 Design Area: 8.67" x 8.67" ~ Materials List: 13" x 13" 18 Ct Canvas, Sandstone ~ 13" x 13" Stretcher Bars ~ Japanese Tacks ~ #22 Tapestry Needle ~ Caron Snow, 22 Strawberry(1), 23 Chocolate(2) ~ Caron Watercolours, 021 Peach Melba(1-uses almost all), 66 Jade(1-uses almost all) ~ DMC #5 Perle Cotton, 612 Light Drab Brown(1), 712 Cream(2), 800 Pale Delft Blue(2), 895 Very Dark Hunter Green(1) ~ Rainbow Gallery Silk Lame` Braid #18, SL77 Royal Blue(1), SL159 Imperial Blue(1) ~ Rainbow Gallery Treasure Braid #12, TR282 Copper(1). # in () indicates the number of skeins or cards needed. 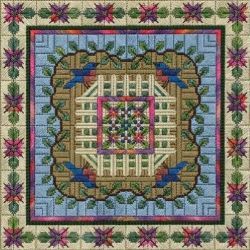 Design Area: 9.78" x 9.78" ~ Materials List: 14" x 14" 18 Ct Canvas, Sandstone ~ 14" x 14" Stretcher Bars ~ Japanese Tacks ~ #22 Tapestry Needle ~ Caron Snow, 22 Strawberry(1) ~ Caron Watercolours, 035 Raspberry Sherbet(2), 136 Cedar(1), 156 Indigo(2), 254 Porcelain Blue(1) ~ DMC #5 Perle Cotton, 422 Light Hazelnut Brown(1), 798 Dark Delft Blue(1), 801 Dark Coffee Brown(1), 3051 Dark Green Gray(1). # in () indicates the number of skeins or cards needed. 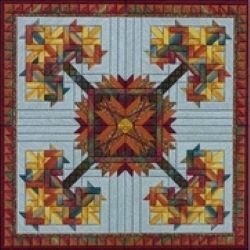 Design Area: 8.44" x 8.44" ~ Materials List: 12" x 12" 18 Ct Canvas, Eggshell ~ 12" x 12" Stretcher Bars ~ Japanese Tacks ~ #22 Tapestry Needle ~ Caron Watercolours, 045 Flame(1), 065 Emerald(1), 085 Antique Brass(2), 140 Blackwatch(1) ~ DMC #5 Perle, 422 Light Hazelnut Brown(1), 987 Dark Forest Green(1), DMC Floss, 3853 Dark Autumn Gold(1) ~ Rainbow Gallery, Alabaster BG7 White Pearl(2), Overture V126 Timberland(2). 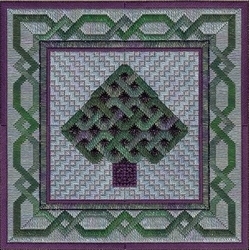 # in () indicate number of skeins or cards needed. 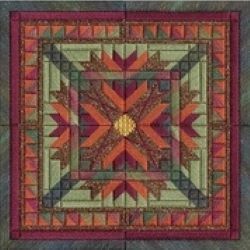 Design Area: 8.33" x 8.33" ~ Materials List: 12" x 12" 18 Ct Canvas, Brown ~ 12" x 12" Stretcher Bars ~ Japanese Tacks ~ #22 Tapestry Needle ~ Caron Watercolours, 051Abalone(1), 065 Emerald(1), 121 Evergreen(1), 133 Delphinium(2) ~ DMC #5 Perle Cotton, 327 Dark Dark Violet(1) ~ Kreinik #12 Braid 9294 Periwinkle(1) ~ Rainbow Gallery Gold Rush 14, WG85C Deep Purple(1). # in () indicates the number of skeins or cards needed. 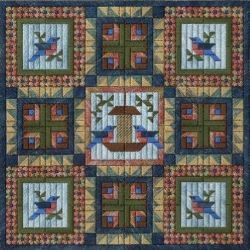 Design Area: 8.78" x 8.78" ~ Materials List: 13" x 13" 18 Ct Canvas, Sandstone ~ 13" x 13" Stretcher Bars ~ Japanese Tacks ~ #22 Tapestry Needle ~ Caron Snow, 17 Carbon(2), Caron Watercolours, 085 Antique Brass(1), 173 Redwood(2), 220 Cheyenne(1), 222 Sierra(1) ~ DMC #5 Perle Cotton, 926 Medium Gray Green(3), 927 Light Gray Green(1). # in () indicates the number of skeins or cards needed. 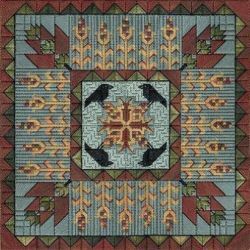 Design Area: 4.00" x 8.00" ~ Materials List: 8" x 12" 18 Ct Canvas (Sandstone) ~ 8" x 12" Stretcher Bars ~ Japanese Tacks ~ #22 & #26 Tapestry Needles ~ Caron Watercolours, 074 Storm Clouds(1), 137 Copper(1), 159 Silver Blue(1), 222 Sierra(1), 255 Cornflower(1) ~ DMC #5 Perle, 822 Light Beige Gray(1), Color Variations #5 Perle, 4130 Chilean Sunset(1), Floss, 3371 Black Brown(1) ~ Rainbow Gallery, Gold Rush #18, GD109C Bronze(1), Overture, V122 Caravan(1), Petite Very Velvet, V605 Camel(1). # in () indicates number of skeins, cards or spools needed.